Almost all of the world’s nations have laws specifying at what age a couple can marry, and in most of these countries, those under the age of 18 are allowed to wed. 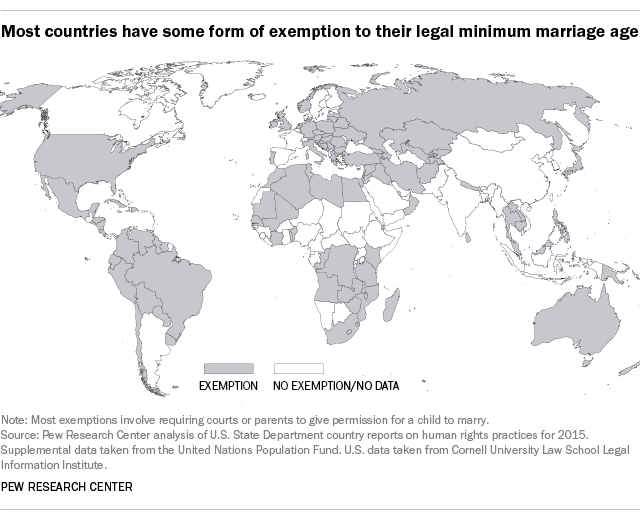 Indeed, at least 117 nations (including the United States) allow children to marry, according to a new Pew Research Center analysis of data on 198 countries and territories from the U.S. State Department and United Nations. While in many countries the age of 18 legally marks the end of childhood, marriageable age does not always correspond – legally or otherwise – with the age of majority. Ostensibly, most countries (153 of 198) require that people who want to marry be adults (18 years or older). But many of these same nations have some kind of exemption to this requirement. For instance, in Australia, if a person is at least 18, their spouse can (with judicial approval) be as young as 16. And in many other countries, such as Iraq, Jamaica and Uruguay, children can marry with parental permission. Sudan has the largest gender gap: Girls can marry at 10 and boys can marry at 15 or puberty without parental or judicial permission. Several countries also have different age requirements depending on religious affiliation. For example, in the Philippines, couples must be 21 to marry without permission, unless they are Muslim; Muslim boys can marry at 15 and Muslim girls can marry at puberty. And in Tanzania, Muslim and Hindu girls can marry at 12 as long as the marriage is not consummated until the girl reaches the age of 15. More than two dozen countries (27) require that one or both spouses be older than 18. Roughly half of these nations (14 of the 27) are in the Asia-Pacific region. For instance, China requires men to be 22 and women to be 20 and, in Singapore, couples under the age of 21 must have special permission to wed. Fully 96% of countries have laws that specify when people can legally marry. Only six countries – Equatorial Guinea, Gambia, Saudi Arabia, Somalia, South Sudan and Yemen – do not specify a minimum age for marriage. 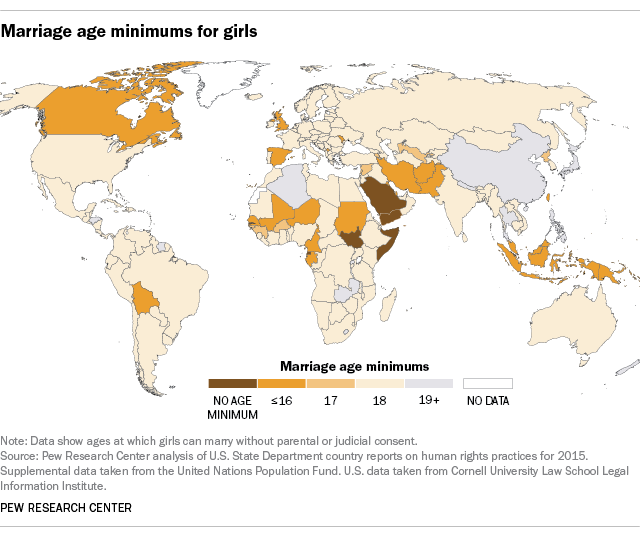 In many countries, even those that allow minors to wed, minimum age requirements are often ignored. According to the UN and State Department, children (including some just above or even below the age of puberty) are often forced to marry. In Albania, Bulgaria, Macedonia and the Ukraine, for instance, girls in Romani communities often marry below the legal minimum age. And in Pakistan, the State Department noted that, despite prohibitions, forced marriages were common for many children, some younger than 15. Note: For State Department and UN summaries of minimum marriage ages in 198 countries, click here (PDF). This post has been updated to reflect information received after publication. Correction: An earlier version of this post miscategorized Bolivia’s minimum for girls.